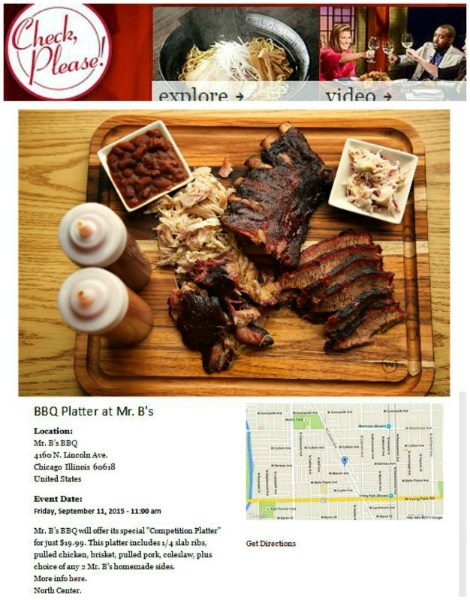 Since quietly opening late spring, Mr. B’s BBQ has been busy racking up ribs, along with throngs of followers, at its Lincoln Avenue location in Chicago’s North Center neighborhood. With indoor seating for just 20, an additional 14 on its outdoor patio, this tiny, family-owned BYOB is creating plenty of big buzz…and big flavor. Featuring secret family recipe spice rubs and sauces, Mr. B’s BBQ ribs, pork, chicken and brisket are smoked low and slow daily in-house, over apple and hickory wood. 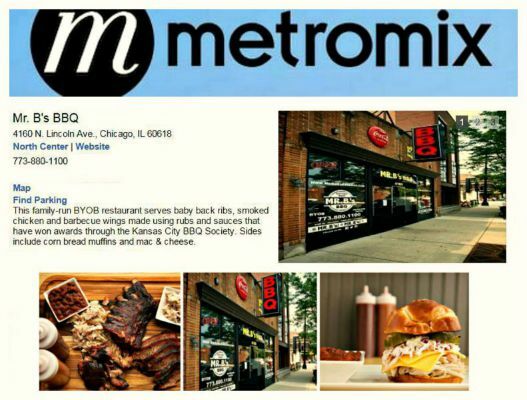 Mr. B’s BBQ represents a labor of love for Chicago’s Bogyo family. Brothers Chris Bogyo (Le Cordon Bleu grad, formerly City Winery), Greg Bogyo (Chicago police officer), and Jeff Bogyo share a long-time passion for backyard barbequing. After years of rave reviews from friends and neighbors, the brothers, joined by Chris’ wife Nicole and her secret-recipe bbq sauces, took the show on the road. Armed with a fleet of Weber grills, the Bogyos joined the prestigious Kansas City Barbeque Society, competing at events across the Midwest. “We pulled-up to our first competition hauling 7 Weber grills, most of them salvaged. Others were using $12,000 smokers, but we weren’t intimated,” Chris remembers. 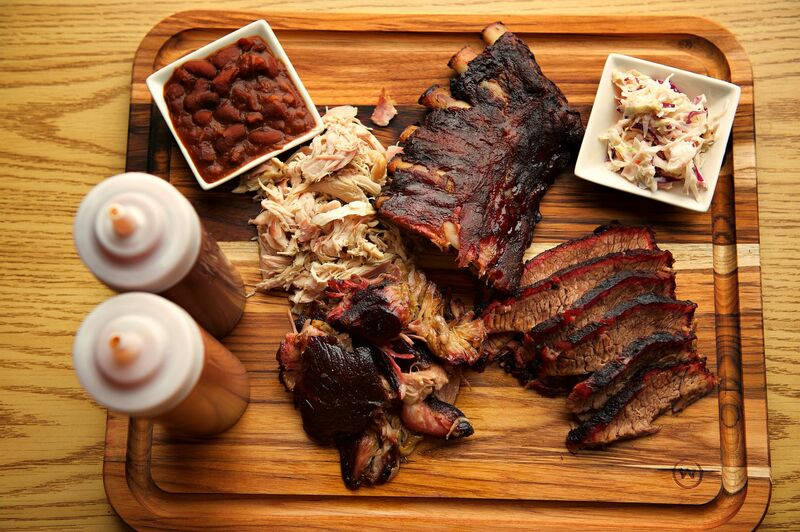 Menu stand-outs include the Competition Platter — featuring 2-pound of meat, including 1/4 slab ribs, pulled chicken, brisket, and pulled pork, $25. 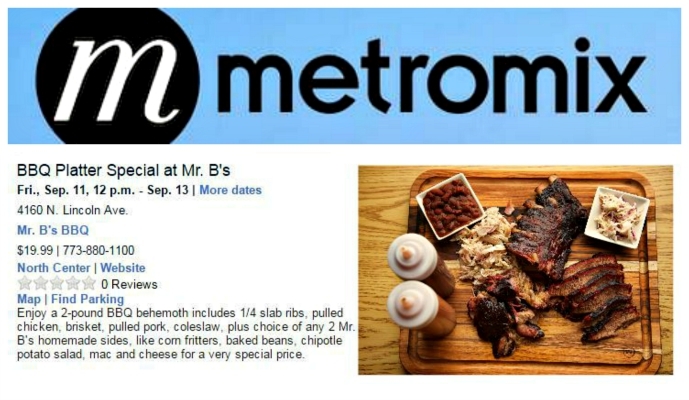 All of Mr. B’s menu items are served with a choice of home-made sides, like corn fritters, baked beans, mac and cheese, and chipotle potato salad. All items are available for carry-out, as well as for delivered-to-your-door catering for parties and special events. 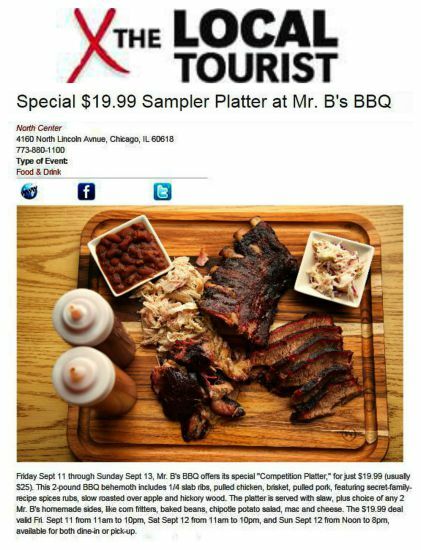 Mr. B’s BBQ, 4160 North Lincoln Avenue, Chicago. 773-880-1100. BYOB. 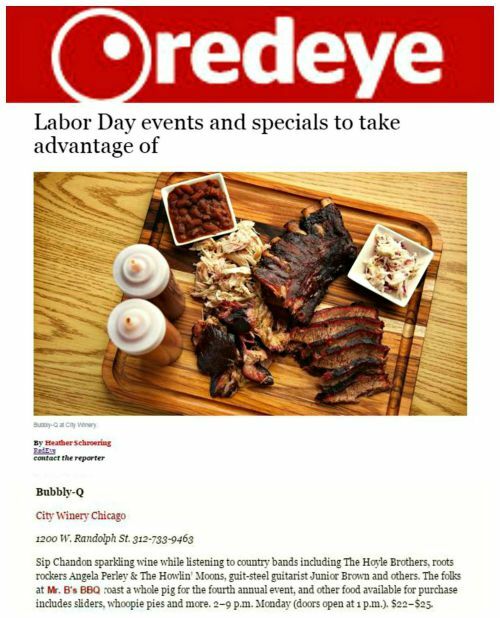 This entry was posted in Uncategorized and tagged Barbeque Mike Foran Public Relations, Bogyo, Chicago, Chris Bogyo, Mr. B's BBQ. Bookmark the permalink.